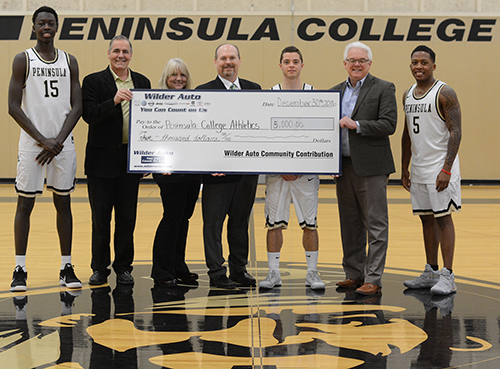 PORT ANGELES, Washington (January 3, 2017) –On Friday, December 30, Wilder Auto presented the Pirate Athletic Association at Peninsula College with a $5,000 donation to support athletic scholarships. “This is a very significant gift and will greatly impact our ability to provide scholarships for student athletes,” said Rick Ross, Associate Dean for Athletics and Student Life. “The Wilder Auto family continues to be a huge supporter of this community. Peninsula College is coming off a fall season that saw the men’s and women’s soccer teams both win league titles and the women’s team win the Northwest Athletic Conference championship. The men’s and women’s basketball teams are defending league champions and they are preparing to tip off league play on Jan. 11. For more information contact Rick Ross at (360) 417-6533 or rross@pencol.edu.